The third Veera release from this gifted pair. 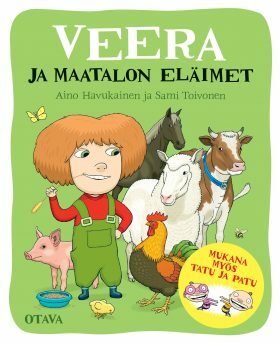 This book takes Veera, Tatu and Patu to explore a farmyard; the barns, the stable, the chicken-house, sheep-pens, and the piggery. The two boys don’t know how cows should be milked, and in fact they are not at all sure what cows even look like. Veera has to correct some of their comic misconceptions, and after a series of funny incidents and accidents, the trio finally find their way into the cowshed in time for evening milking. Best of all, the farmer’s wife lets the boys try their skills at the undeniably difficult task of hand-milking.